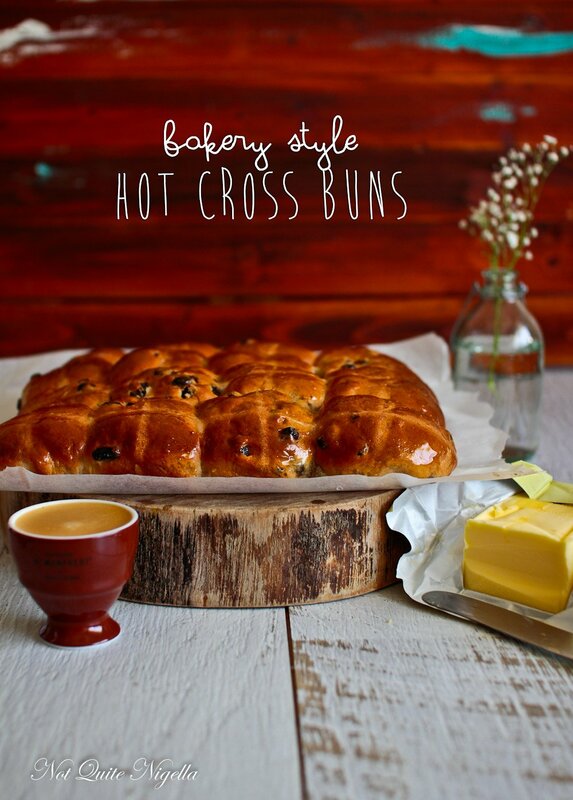 The Softest Bakery Style Hot Cross Buns for Easter! What is your favourite part of Easter coming up? Is it the hot cross buns? The Easter eggs? Or just the luxuriously long weekend? For me it's the Easter buns (and the weekend let's be honest ;)). These aromatic soft buns clustered in dozens or half dozens often pop up at bakeries and supermarkets months before Easter. Making your own is satisfying because there is nothing like buns that have been freshly pulled out of the oven. However I've always admired the texture of bakery style buns. They're tall, fluffy and soft and I wanted to do some of my very own. And I had a little trick up my sleeve of how to do it. A little trick that some bakeries use to keep their buns soft and moist and lasting longer: tangzhong. Tangzhong is a simple pudding-like roux made with flour and water cooked to 65ºC which is incidentally the name of the cookbook that was said to introduce the concept of Tangzhong to a greater audience. Yvonne Chen the author says that at that temperature the gluten absorbs the moisture and becomes leavened or rises. 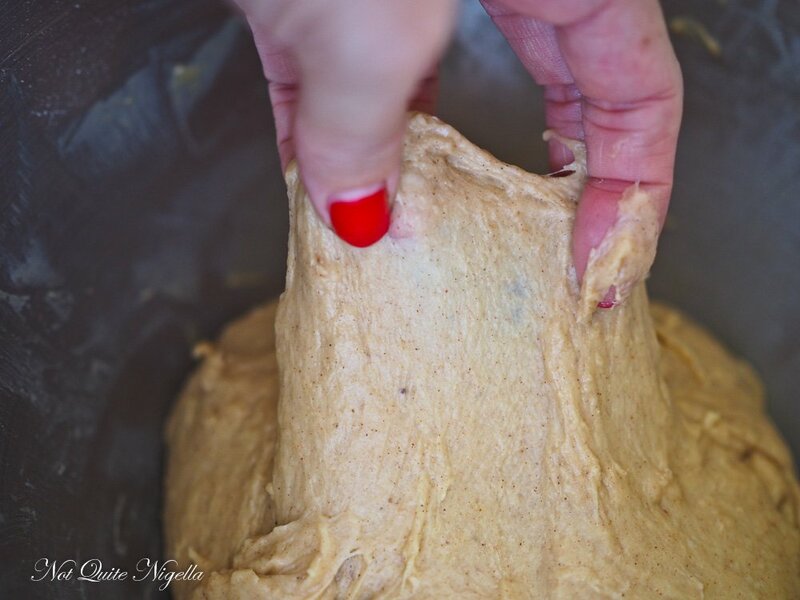 And by using a portion of this within your whole dough means that it locks in the moisture into your bread while still being able to form gluten strands to support the weight. If only the weather would co-operate. The night before I made these buns, it was 35ºC/95F. The next day promised to climb to 38º/100ºF. I was brushing my teeth in the bathroom and looked out the window. I could see apartments through our wide open window. It's like a fishbowl in our apartment. Every one had their lights on, balcony doors open, blinds or curtains swaying languidly with the breeze. One man talked very loudly on the phone, his one way conversation reverberating around the garden and brick building below. Smells of dinners cooking and a barbecue on one balcony swirled under my nose. The noise of the busy road outside could be heard as a faint hum. I knew that tomorrow I'd have to put my big girl pants on and turn on the oven and somehow forget the heat. You see the thought came to me that night for these. In the fridge sat a half collapsed chocolate sculpture. I had stupidly, vainly, boastfully thought that I could defy the odds of the heat miser and make a chocolate item in an apartment without air conditioning. And I got cocky because as soon as I set it up to photograph, it collapsed. This was after three attempts. Chocolate was not meant to be. But what about hot cross buns? I know everyone loves chocolate but Easter buns are the most exciting thing at Easter for me. I wanted to make a recipe that created fabulous bakery style buns. The ones that smell so good that you have to fondle and buy a pack. Ones that were soft and downy. And then it came to me. Tangzhong. That sounds mysterious doesn't it but if you're a bread baker you may know it. It's a water roux paste that Chinese and Japanese bakeries use to get that super soft bread. It also makes bread last softer and sometimes when there's just two of you eating hot cross buns you need a few days to get through them. I saw Grace's tangzhong recipe and it looked fabulous so I based it on that. As I was sliding them into the oven it felt like I was living on the surface of the sun but when I pulled them out I was rewarded. They smelled just right and they didn't overbake at all (sometimes I find that they brown a bit too much, I like my hot cross buns a bit paler). 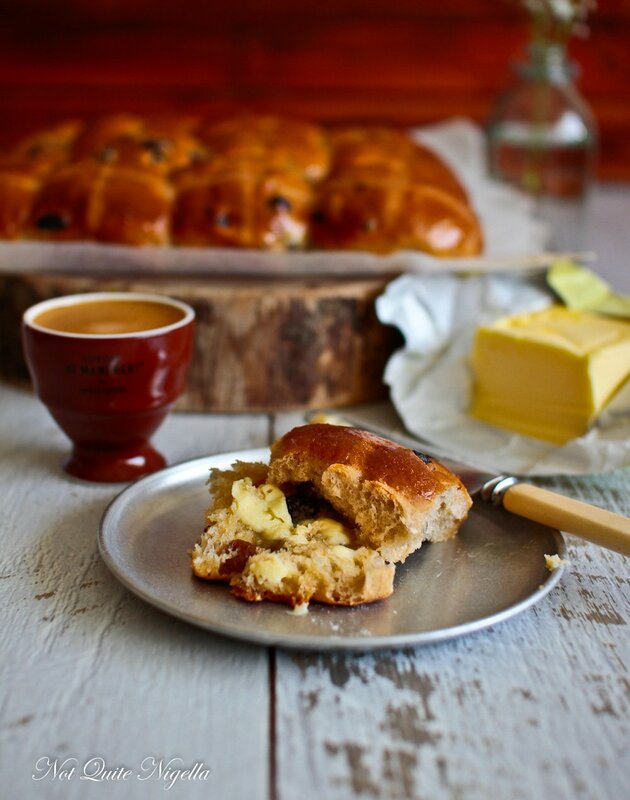 And once I split on and spread it with butter I was so glad that the chocolate thing collapsed and instead I had this super soft hot cross bun recipe instead. 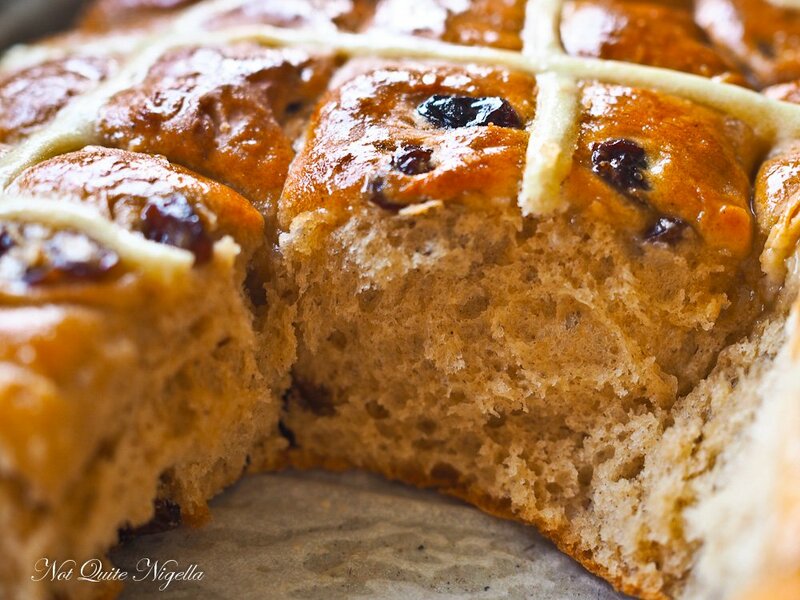 So tell me Dear Reader, what food excites you about Easter the most? Is it the hot cross buns? Easter eggs? Lamb? And what are your plans for this long weekend? Have you ever tried baking with tangzhong? Step 1 - Make the tangzhong or water roux. Please don't let this step put you off. It makes a huge difference for the softest of buns. Take 1/6 cup of the flour from the whole measurement and whisk with 1/2 cup of water in a saucepan until smooth. Heat on medium heat and stir until it thickens to become a roux. You want it to reach 65ºC/149ºF and it will take about 5 minutes. 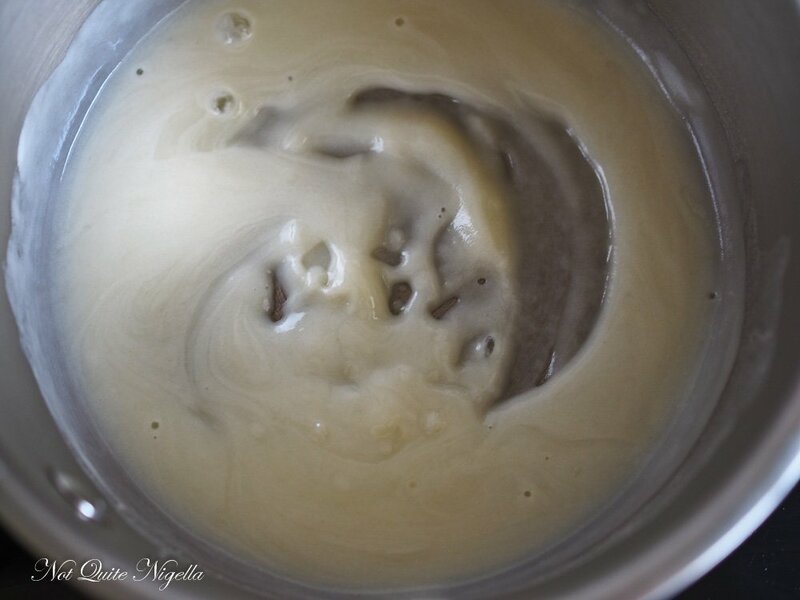 Remove from the heat and add the milk in two lots and the honey and whisk until the honey melts. Cool to 45ºC/113ºF. 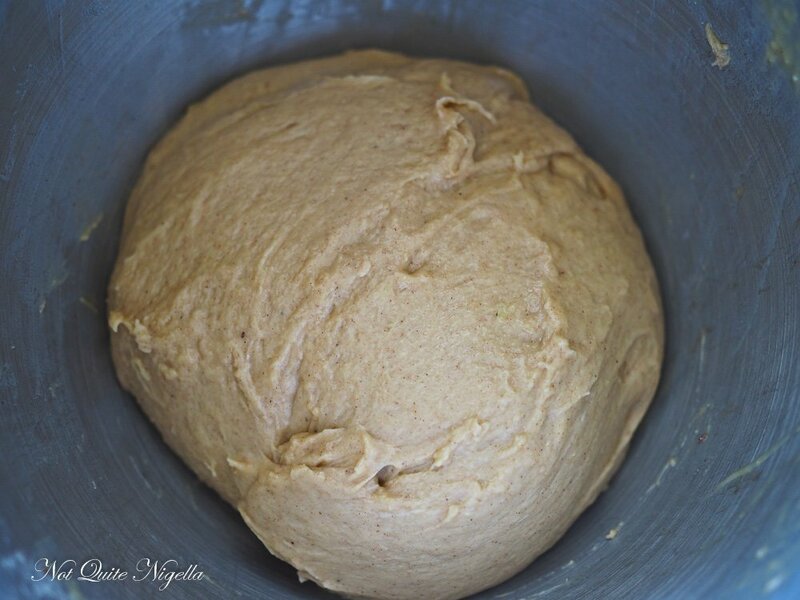 Step 2 - Place the rest of the bread flour (use 3.5 cups and then add the extra 1/4 cup if you need it), yeast, cinnamon, nutmeg and mixed spice in the bowl of an electric mixer fitted with a dough hook and mix to combine. Step 3 - Whisk the eggs into the milky tangzhong mixture and add to the flour mix and knead until elastic. Add a bit more flour if the mixture is too wet. Finally add the butter cubes one at a time. It needs to be elastic and stretchy but not break. You should be able to pull it apart between your fingers and see through it without it breaking. Roll it into a ball making sure that there are no cracks on top of the ball and allow it to rise in a warm place. As I was living on the surface of the sun that day it only took 40 minutes to triple in size. Step 4 - Preheat the oven to 180C/350F. Mix the cross ingredients together to make a pipeable paste and place in a small piping bag cutting a small hole at the end. 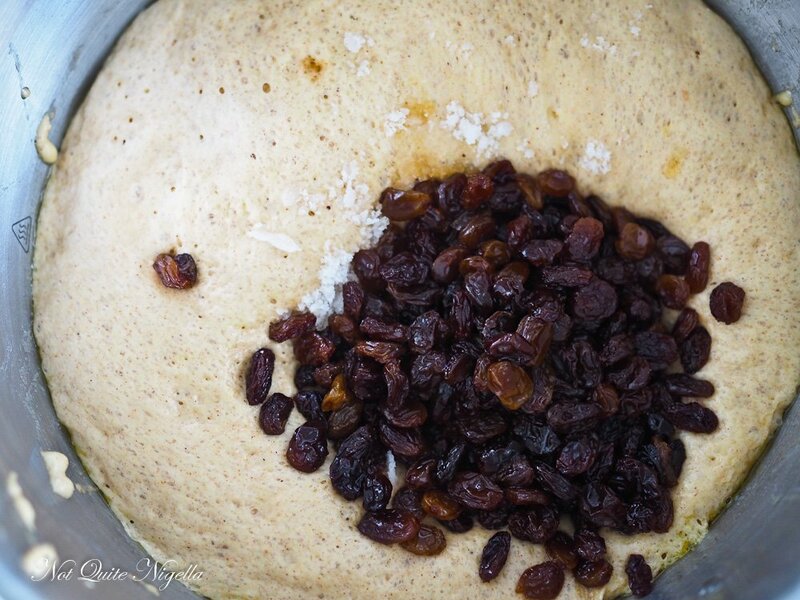 Punch down the dough and knead in the salt and the drained sultanas (reserve the rum to mix with the butter to create rum butter). Line a baking tray with parchment. 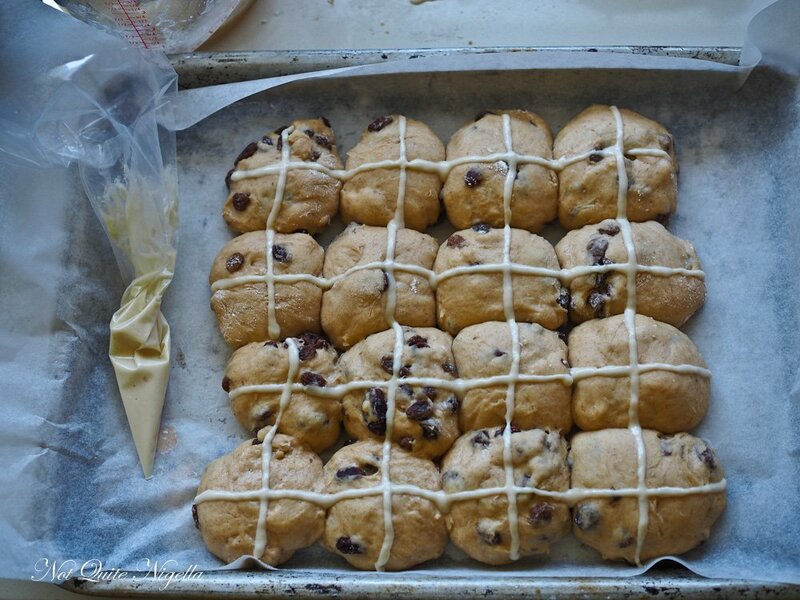 Flour your hands and a surface and shape 12-13 easter buns. I like them to have soft sides so I bound it with a Bake Snake (silicon sides). Do not give these a long rise, as long as they puff up a bit that is perfect. Pipe crosses on top and then bake for 30 minutes. Step 5 - To make the glaze, whisk the sugar, boiling water and gelatine until smooth and brush over the hot buns. Serve with rum butter (whisk 75g-100g/2.65-3.5ozs. very soft butter with the leftover rum).